Being 2 weeks away from home while exploring the sights in Aotearoa, we didn’t really need to put up the nights in too many different lodgings. Renting a campervan has certainly helped not only to keep us rooted to a private abode but also helped to do away with the undesired packing and unpacking when moving from place to place. Upon our arrival, we had checked in for a night at the All Seasons Auckland Hotel in order to enjoy the convenience of exploring the city. 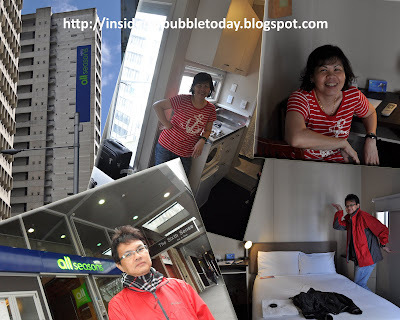 It is located right in the heart of the city and just round the corner to the Sky Tower. I had booked it online a few months earlier and the room was offered at NZ$67 a night. I was uneasy with my choice initially after reading so many unpleasant reviews about it on Trip Advisor. However upon checking in, lo kong and I were more than pleased with our room on the 14th floor (we’ve stayed in a much smaller and rundown room in comparison) although we can’t say the same for the customer service and facilities offered. The reception and housekeeping crew were made up of foreign labor of Indian origin except at the cafe that unfortunately did not looked appetizing all. Confirming one of the reviews I’d read, the hotel did actually operated with only one functioning lift. The other lift still remained out-of-order after so many months. Because of that, we had to wait for almost 15 minutes before we could catch the lift to our room. After refreshing ourselves, we quickly went out to explore the city. We only return very late in the evening and were right smacked into a swelling group of guests waiting for the lift. After almost 30 minutes, we had to patiently wait for the hotel’s appointed renovator to unload his tools and debris from the lift while bearing a smirk on his face. Gosh … the lift had a dual purpose as a service lift as well! Some ignorant guests who were too eager to get to their rooms quickly overloaded the lift causing it to jam. This causes everyone to be stranded until the technician could arrive at the earliest in half-an-hour’s time. Some guests made their dissatisfaction and threats heard while the rest of us decided to use the lift. Thank goodness lo kong and I were fit enough to climb the stairs to our room on the 14th floor! I am sure I will never recommend this hotel to anyone … ever! When we passed this hotel almost 2 weeks later, we noticed that the hotel was undergoing more extensive renovations. Regretfully, I don’t think the hotel needs the facelift anymore than they need a total overhaul of its customer service and its rundown equipments! In NZ, all hotels observed a check-in time at 2pm and check-out at 11am. We were fortunate to be able to check in earlier to our next humble abode at The Spencer on the Byron in nearby Takapuna. 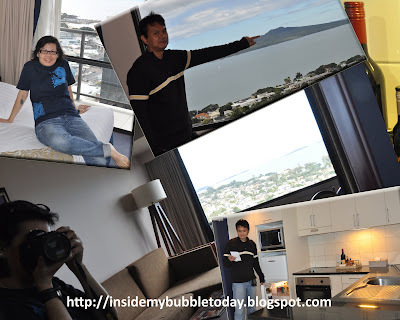 It was a 4-star 19-storey hotel that had a stunning view of Auckland city and other famous landmarks such as the Rangitoto Island and the Hauraki Gulf right from our balcony. It was about a 10-minutes drive from the city where lo kong were to participate in the inaugural Jerry Clayton North Shore Full Marathon. The starting line was just a short walk away. I believe I had really gotten a great deal at NZ$118 a night considering the prevailing rate for our one-bedroom suite when we checked in was going for NZ$250 a night. It had a fully equipped kitchen and lo kong even did some light cooking for snacks. I did our first batch of laundry right in our room as it also came with a washing machine and dryer … all with no extra charges. Rightfully there shouldn’t be any grouses about their standard and quality. However, due to their overzealous housekeeping staff, lo kong was almost caught in a state of undress twice! Despite my acknowledgement to their knocking, they had been too impatient for us to let them in that they used their own master-key open the door. Now … that’s not quite right don’t you think? Further why didn’t they refill the fridge before we checked-in anyway? Anyhow, despite the little mishaps, I wouldn’t mind staying there again if the opportunity ever permits and I have no qualms recommending it to anyone either. In fact, the rugby team from France is staying there at the moment for the Rugby World Cup 2011. Today’s prevailing rate is more than NZ$300 a night since it is a peak season again … it is spring time now. After 2 nights’ stay at The Spencer, we took delivery of our campervan for the next 10 days of our stay in NZ. That's whole new experience where pampering is out the window! Anyway, the next round of hotel comfort was during our last night in Kiwiland. Upon returning our campervan, we checked into Best Western BK's Pioneer Motor Lodge which was only a 3 minutes drive to the airport. It came with a private jacuzzi and our stay was worth every cent of the NZ$112 we paid even though it was only for a night. It's current rate is going for NS$145. No doubt they provide free shuttle service for their guests to and from the airport, we were still surprised that they had purposely drove out to the airport just to fetch us when we got stranded there after returning from the city. A 3-minute taxi ride from the airport to the hotel would have cost us NZ$30! worth every cent of it!!! Stay tuned till I continue more on our experience in a campervan around the North Island! Great fun in NZ..best wishes for the MidAutumn Festival.. Thanks a bunch and all the same to you too, Bananaz. Frankly I don't understand what you have written in Mandarin but I know they are all good wishes. Thank you thank you! !